I’m devoting this latest installment in my bi-monthly column to tip my hat to Denise Traver, the owner of, and creative energy behind, this wonderful web site. I’ve been contributing small features on Grand Canyon-related issues and events to Denise’s enterprise since 2005, and it has been an honor to work with such a passionate and committed individual. There is no way to tally the far-reaching impact her site has made on the thousands (millions?) 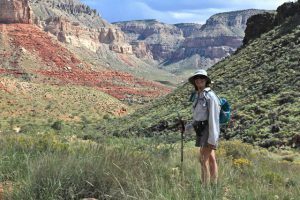 of visitors from all over the world that have turned to Hit the Trail for the latest news and information about the Grand Canyon region and beyond. I first met Denise in the early 90s in her capacity as a field instructor for the Grand Canyon Field Institute, a program I have been directing since 1997. 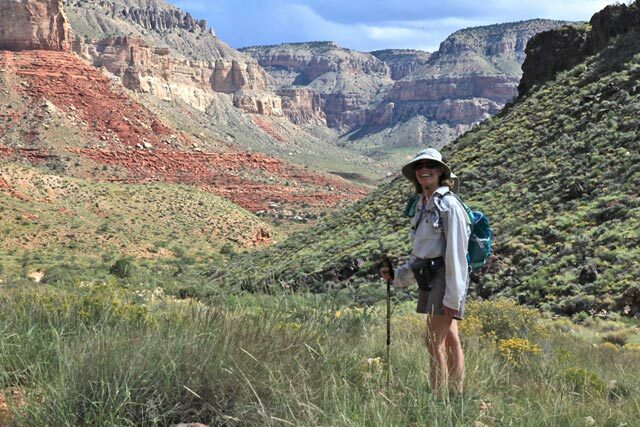 Then as now, Denise’s infectious smile, enthusiasm, and keen knowledge of the natural world in general, and Grand Canyon specifically, enriched countless lives. Over the years we have spent relatively little time together in the backcountry. Recently Denise and I traveled with our spouses to a remote stretch of western Grand Canyon to explore a seldom-visited corner of our beloved chasm. Our time together reminded me why I have yet to miss a deadline in eight years – I would never skip the chance to help this friend of the canyon spread the word on how to enjoy and protect this critical and transformative landscape that we call home. Thanks Denise!